But I think there’s a valuable lesson here. A few weeks ago in one of my daily emails, I mentioned that I sang in a friend’s wedding. Yes, there are many absolutes in the world…but not when it comes to music. Perhaps you’ve received negative feedback like this email. If not, if you stick around this home recording thing long enough, you will. The key is to remember that this stuff is subjective. Not everyone will like everything you do. But there will be some people who like it. Those are the people you cater to, not the naysayers. For example, every month I put one of my mixes on display and ask hundreds of people to critique it. Some months they love it. Some months they don’t. Sure, I’d rather they loved it every time, but that’s not reality. The truth is, I usually like my mix whether they like it or not. And I ALWAYS get new ideas from their feedback. 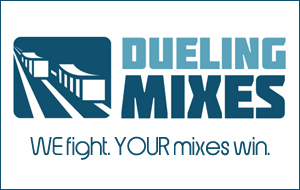 That’s what happens every month over at Dueling Mixes. This month happens to be a month where people are liking Graham’s mix better than mine. But guess what? There are still plenty of people who like my mix. P.S. Please don’t feel like you need to reply to this email. I’m not fishing for compliments here. Just thought it was a teachable moment for both you and me.